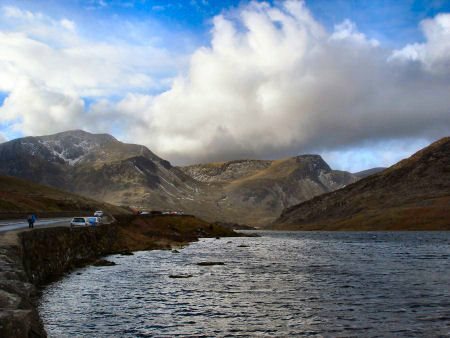 Dramatic Llyn Ogwen, one of the most popular lakes in Wales, is situated south of Bangor, and lies between the two mountain ranges of the Carneddau and the Glyderau. It stands at the head of the Nant Ffrancon Valley approx. four miles from the village of Bethesda. 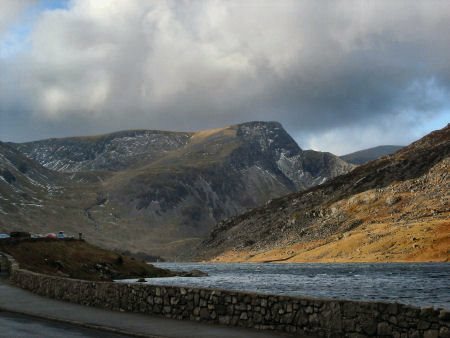 The lake is surrounded by high mountains, including Pen yr Ole Wen and Tryfan, considered to be one of the finest mountains in Wales. 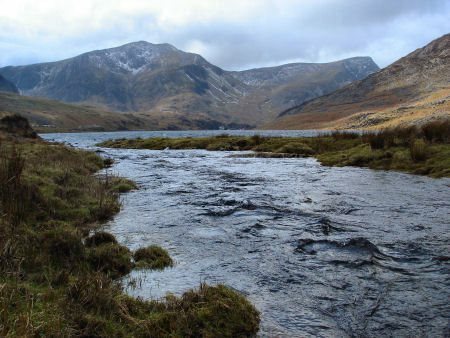 Ogwen is an extremely shallow lake, with a depth of only three metres, and is around a mile long. It lies at a height of 310 metres above sea level. The lake is the source of the River Ogwen. The route to the Glyderau from Llyn Ogwen commences from a footpath at the back of Ogwen Cottage, now a mountain rescue post and is a steep climb. Ancient legend links Llyn Ogwen with King Arthur, and it is said that the lake is the final resting place of his sword Excalibur. In the early twentieth century a dam was constructed to raise the water level forming a reservoir. Due to its superb location, the lake is extremely popular. The A5 runs alongside it and there are several convenient car parks. There is a Youth Hostel, mountain rescue and snack bar at the western end of the lake. This is the only settlement in the valley and so small it isn't included on most maps. The River Ogwen flows out of the western end of Llyn Ogwen and decends rapidly down a series of waterfalls and cataracts known as the Ogwen Falls or Rhaeadr Ogwen. From the falls the river flows on in a north, north westerly direction down to the Nant Francon Valley. As it continues on its course the Ogwen runs alongside the villages of Bethesda, Tregarth , Tal-y-Bont and Llandygai before arriving at the Menai Strait near Bangor. 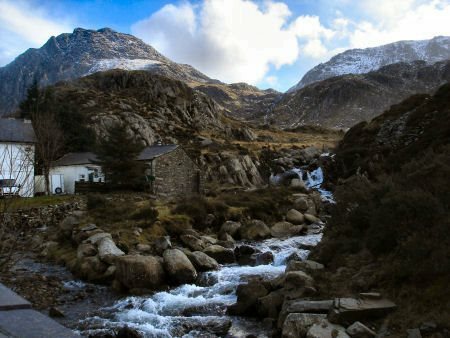 *Commencing at the Car Park at Ogwen Cottage on the A5, take the footpath to the left of the building. Cross the footbridge over the stream and continue along the track until reaching Llyn Idwal. Take the path that leads to the left towards Llyn Bochlwyd. *On arrival at Llyn Bochlwyd, proceed along the path towards the Bwlch Tryfan between Tryfan's South Ridge and Bristly Ridge. At Bwlch Tryfan, a stile passes over the wall which leads onto the Miners Track. Turn left before the wall and continue along the path as it skirts to the left of Tryfan's Far South Peak. *The path will eventually meet another walled area, with a stile leading to The Heather Terrace, just past the Far South Peak. Do not cross the wall but continue up the ridge, avoiding the steep right side of the South Ridge. A scramble follows to reach the summit of Tryfan. *Retrace your steps down to the wall by the Heather Terrace. Cross over the stile and descend to the valley floor, joining the track. Turn left and follow the path, heading in the direction of the road. Turn left just before Tryfan Bach and continue along the path to a stile over a fence. Take the track which leads northwest down the hillside to join a track near the A5. * Cross the road, then follow the track past Glan Dena to the entrance of a farm, pass around the back of the farm. Continue slightly up hill, cross over the stile and follow the marker posts west. Continue on the path to the outflow from Llyn Ogwen. *At the point where Llyn Ogwen goes under the A5, turn left on the road to return to the car park at Ogwen Cottage. Obtain a reliable local weather forecast before setting off and plan a route suitable to those conditions. Check your equipment before leaving, take waterproofs, warm spare clothing, hat and gloves, food, drink, a map, a compass and survival bag. Learn basic mountaineering skills particularly navigation.